collaborated with PHEN to host this milestone event on Capitol Hill. They are pictured above with PHEN president THOMAS FARRINGTON. the broad cross – section of individuals who participated in the summit. 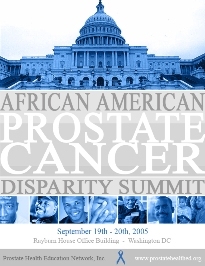 the recorded prostate health awareness messages of eighteen members of the Black Caucus. The first summit was highly successful and it was decided to make this an annual meeting. During the summit FARRINGTON was a guest on the “TOM JOYNER Morning Show.” Click on the radio image below to listen to the interview.